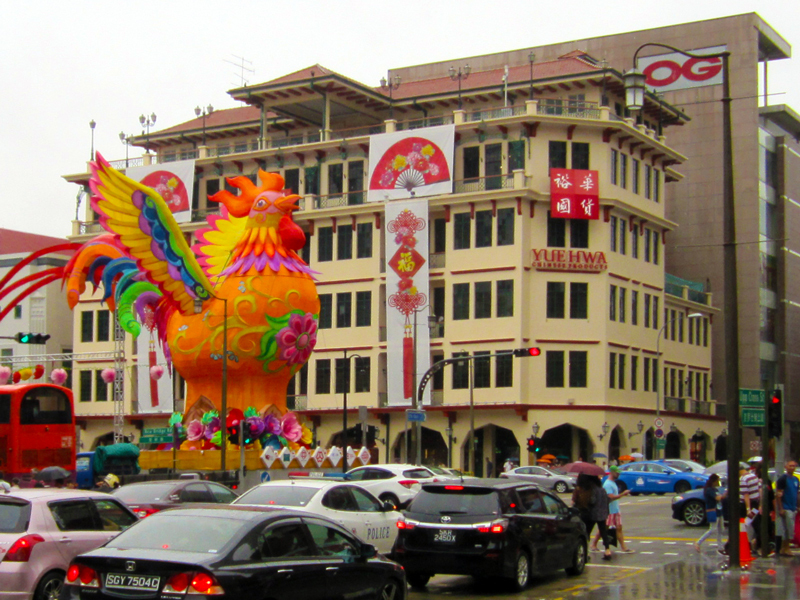 Chinese New Year—not Christmas!—is the biggest retail holiday of the year in Singapore. 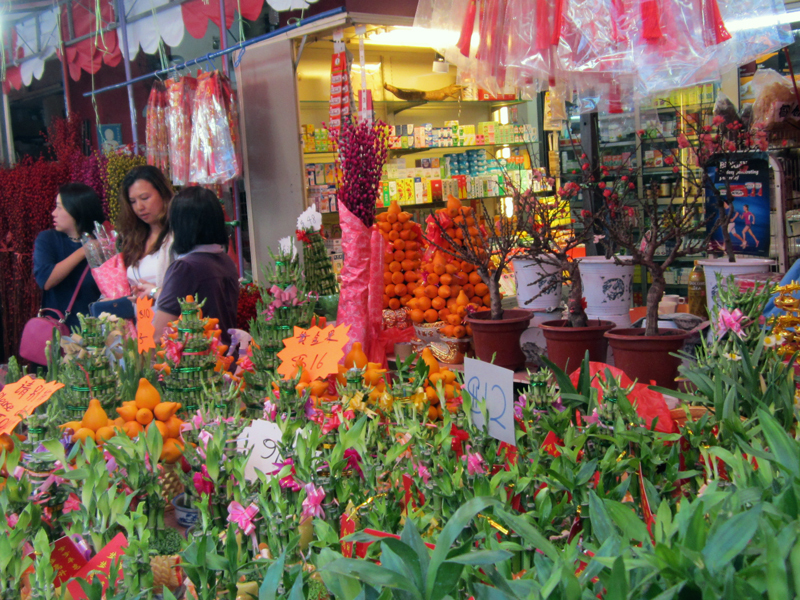 All the shops display red products and play traditional CNY music in the lead-up to the holiday. 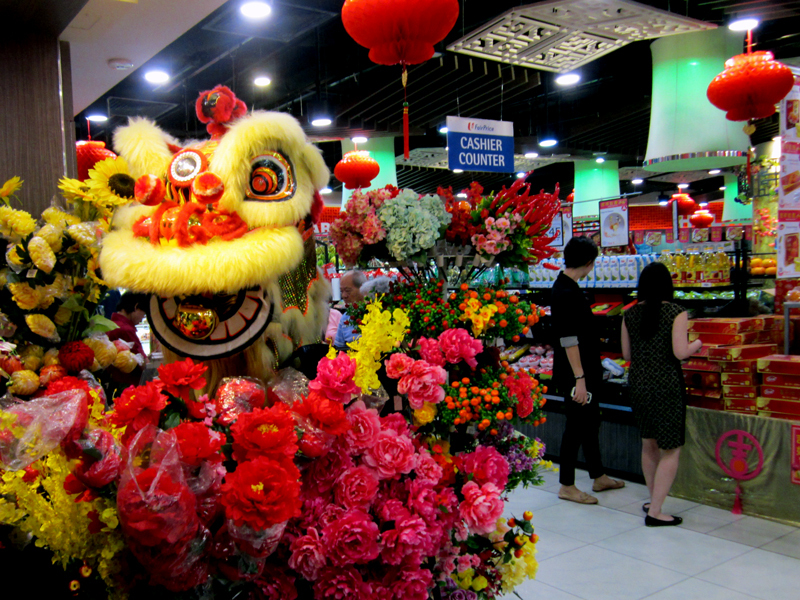 NTUC Fairprice supermarket is selling decorations and snacks for CNY. Anyone ever tells you pink and red don’t go together, laugh. 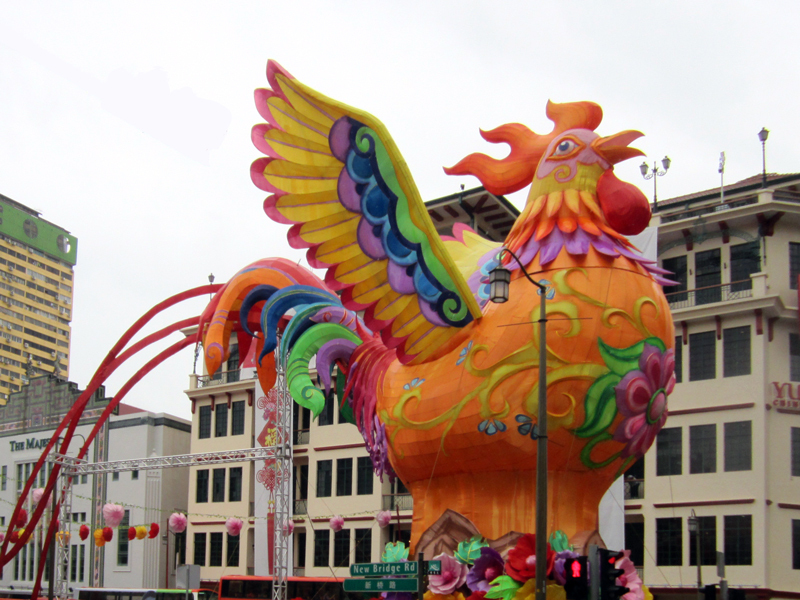 Giant rooster lantern in front of Yue Hwa in Chinatown, Singapore. 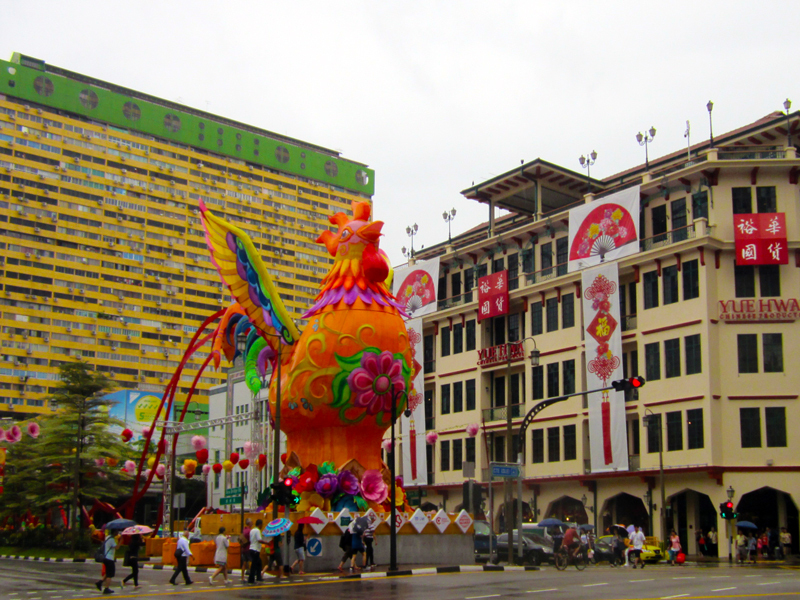 Every year in this spot on New Bridge Road / Eu Tong Sen Street there is a huge display featuring the coming year’s Chinese zodiac animal. 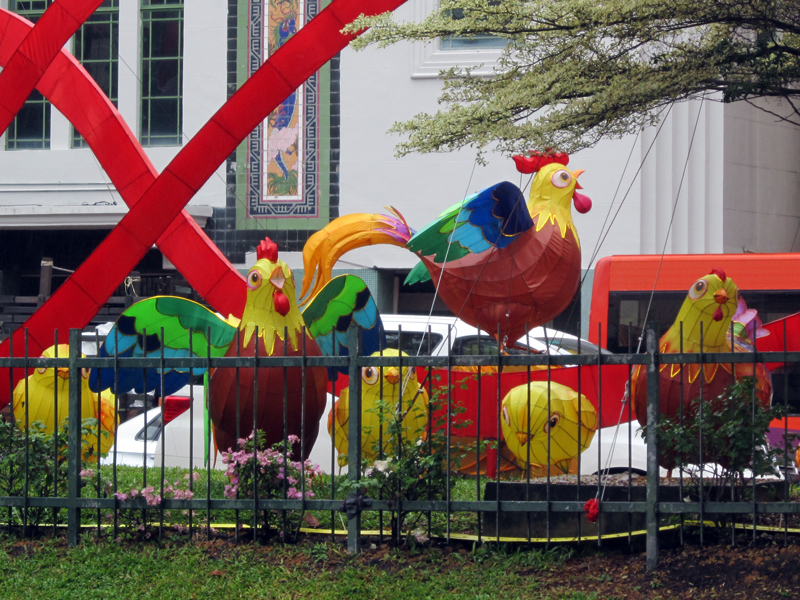 There are little chickens, too. 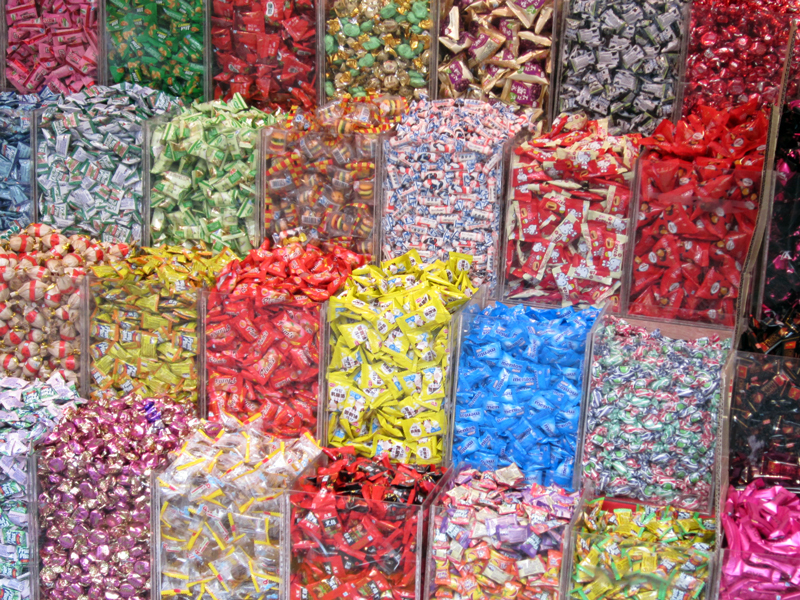 So cute, right? 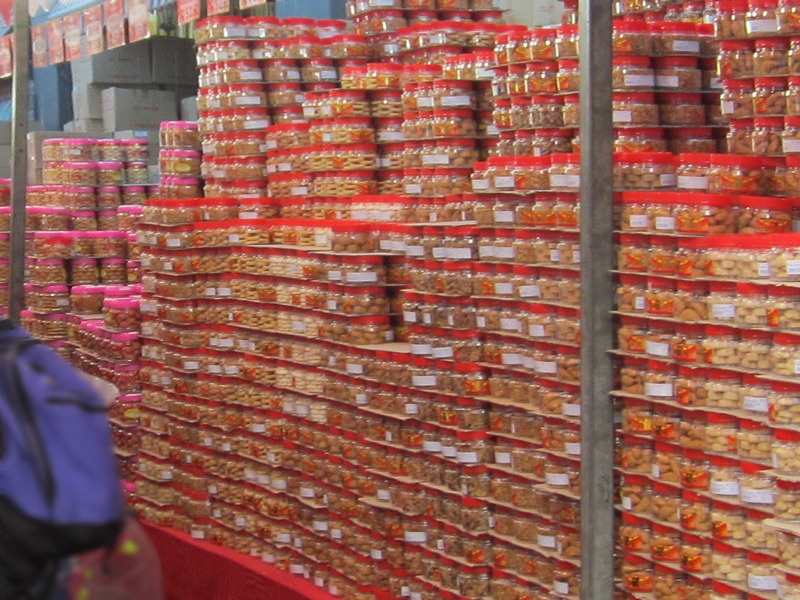 CNY sweets for sale on Temple St.
CNY cookies for sale on Temple St.
Lucky bamboo for sale on Temple St. 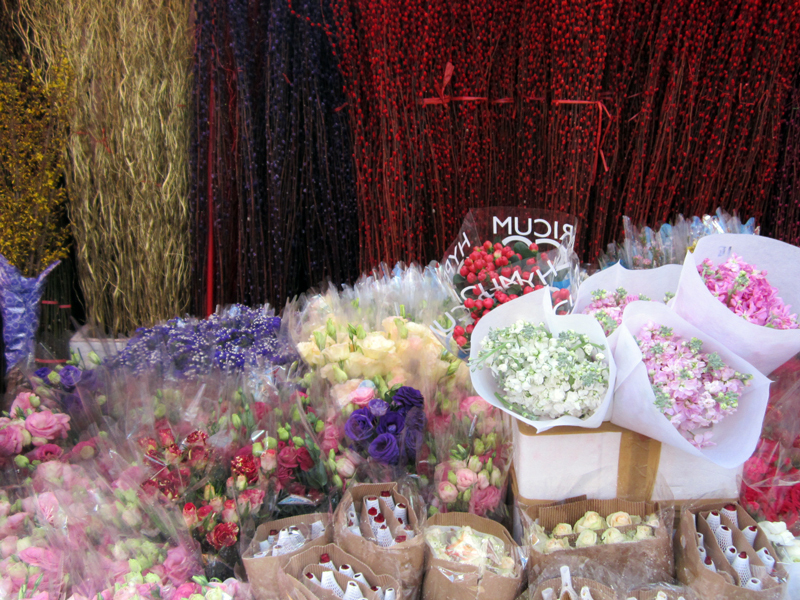 Flowers and cattail decorations for sale on Temple St.
Citrus and other plants for sale on Temple St. Nuts and seeds for sale on Temple St. 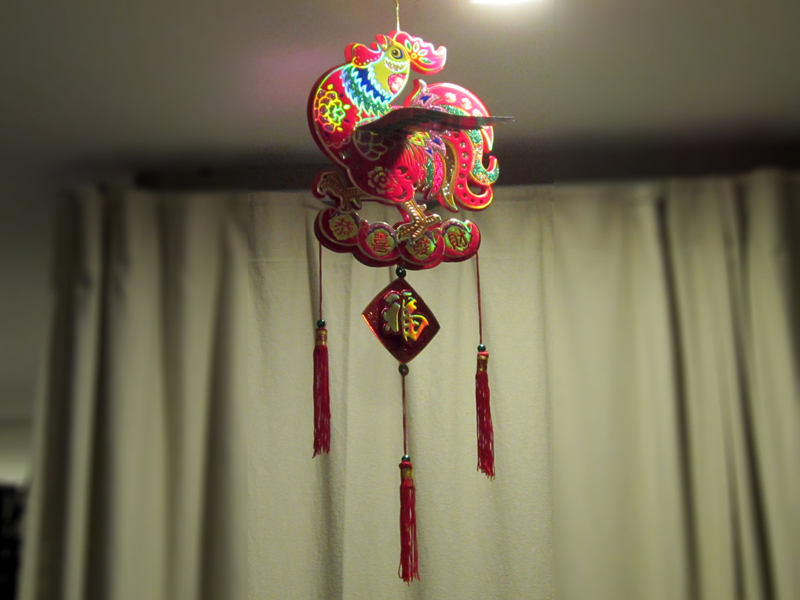 The rooster decoration I bought, hanging from the ceiling! 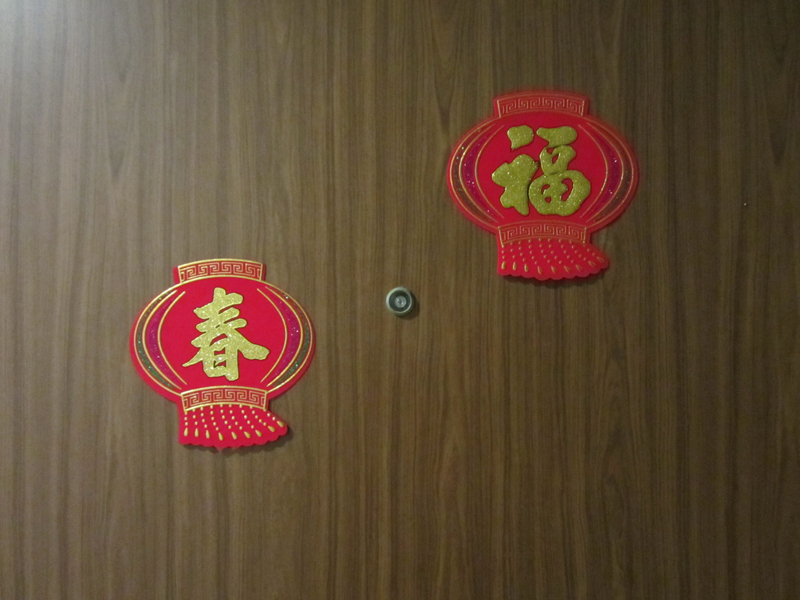 This is four characters combined into one, not an actual Chinese character. 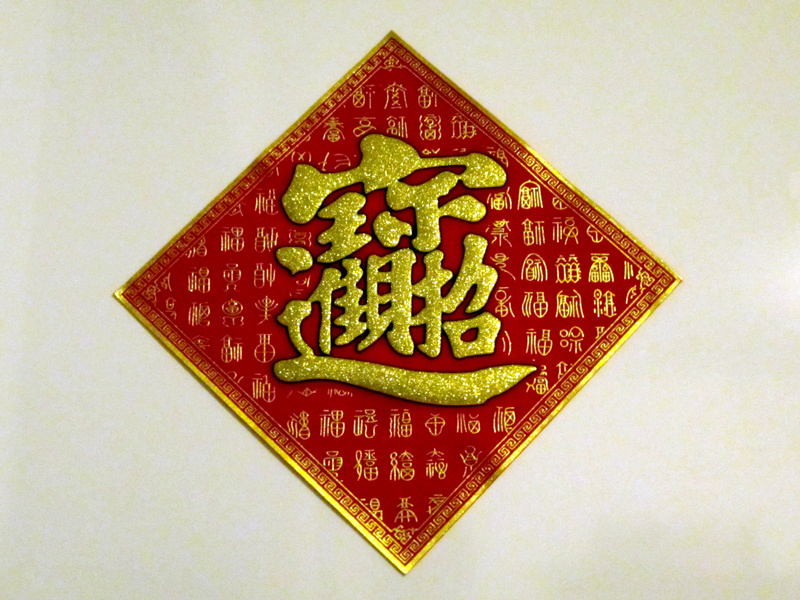 It says zhāo cái jìn bǎo (simplified: 招财进宝, traditional: 招財進寶). 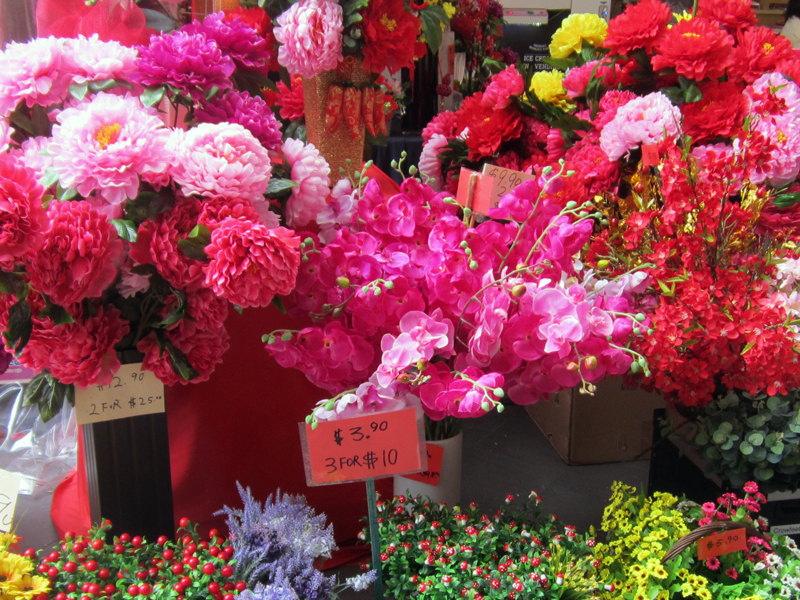 It’s a wish for prosperity meaning something like “to invite wealth brings treasure”. 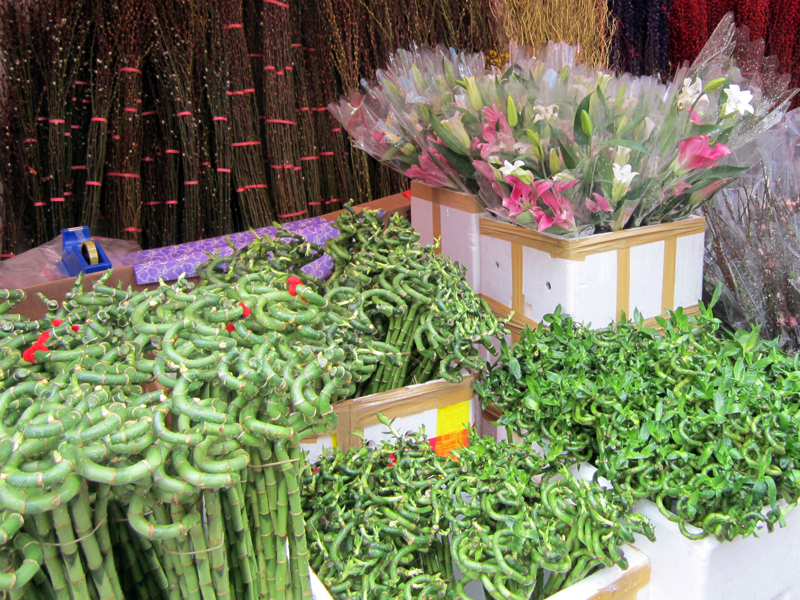 On the left is 春, pronounced chūn, meaning “spring”. 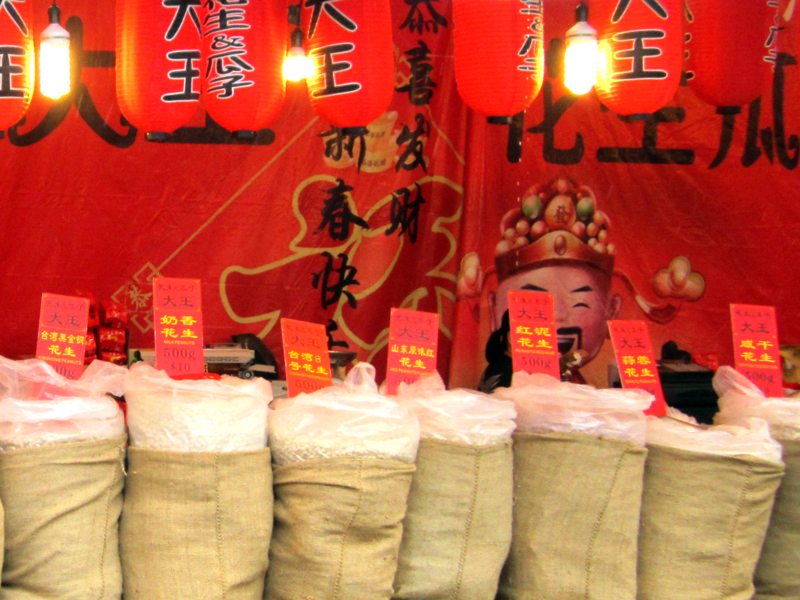 On the right is 福, pronounced fú, meaning “good luck”. 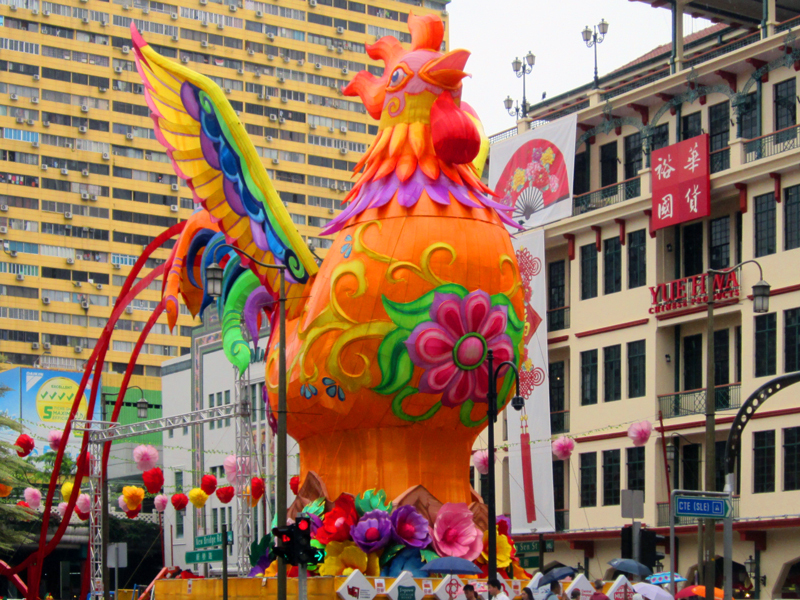 These are two of the most commonly seen characters during Chinese New Year (aka Spring Festival). Sometimes people hang fú upside down because “good luck upside down” sounds like words that mean “good luck arrives”.